Do you require a BodyCam Solution to support frontline staff across a large split transport network? Our Train Operating Company (TOC) re-deployable Body Worn Camera Solution has been developed to support frontline staff due to the rising numbers in assaults across the Rail Industry. 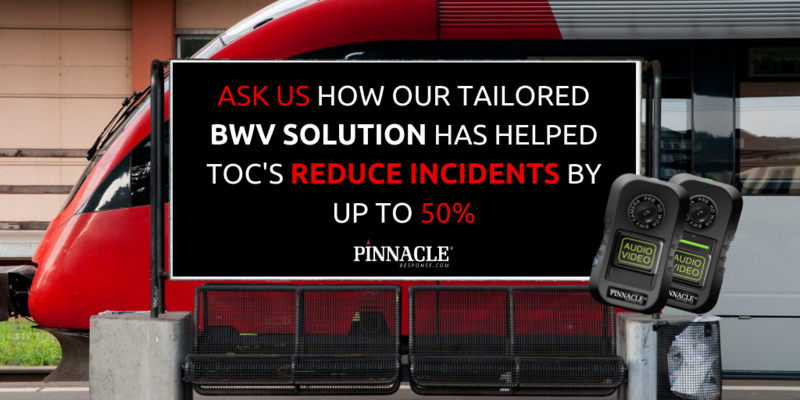 A TOC specific BWV Solution that will work and deliver equal results ranging from a central London railway station all the way to an end-of-line more remote railway station which may have limited staff and WiFi connectivity. The rail industry values the importance of improving both staff and public safety. Virgin Trains began a trial of our BodyCam solution in 2017 in a bid to tackle the rising amount of assaults on frontline staff during shifts. During this period assaults on staff fell by almost half. The trial was successfully completed in February 2018 with results identifying the number of assaults on frontline staff continued to reduce month by month, from 20 assaults in March 2018 down to just 6 in September 2018. Virgin Trains have now rolled out 275 BodyCams to their frontline-staff across their entire West-Coast Network.